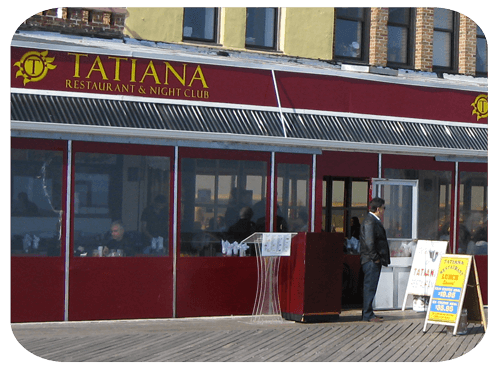 Tatiana and Tatiana Grill are on the Brighton Beach section of the boardwalk, approximately a 20-minute walk from the Coney Island train station. 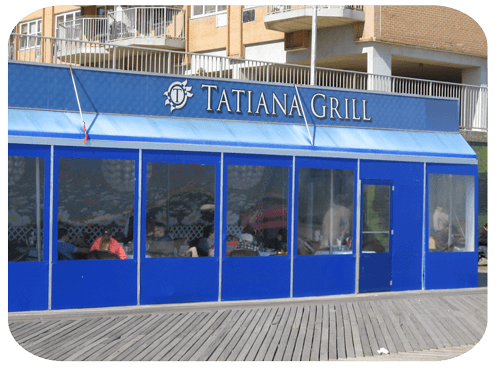 Face the ocean from the boardwalk and walk left, pass the aquarium, and you'll eventually see Tatiana Grill and then the Tatiana. The views, people watching and ambiance are outstanding. I also really enjoy the food, with the menu having everything from Russian to French and Mediterranean items. There are many Ukrainian and Russian families here, and it's definitely not just a tourist spot. As you'd expect based on the location and food, it's not inexpensive, so check out the menu in advance. The wait staff is friendly but can be rather busy on some days, so the level of service can feel as authentically Eastern European as the food at times. Bring a little patience and speak up you need something and you'll be alright. On Friday, Saturday and Sunday nights, the restaurant turns into a lively dance venue. On Fridays and Saturdays, music starts and 9pm and the show starts at 10pm. On Sundays, music starts around 7:00pm with the show starting at 8:30pm. After eating, take a quick walk along Brighton Beach Avenue, the main drag of the Russian neighborhood. There's not particularly much to see, honestly, but there are some Ukrainian and Russian grocery stores and pastries if you'd like dessert. Then take the subway back towards Manhattan from the nearby Brighton Beach B/Q station to save yourself the trek back to the Coney Island station.